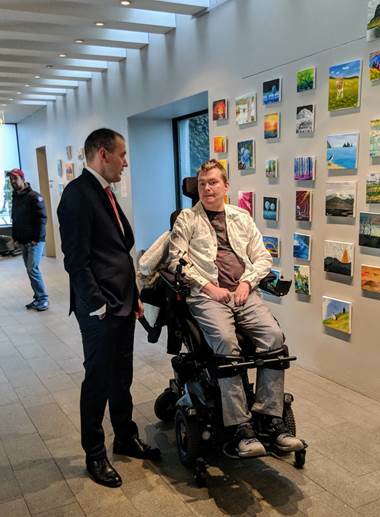 Brandur Bjarnason KARLSSON, mouth painter from Iceland, exhibited his pictures on November 18, 2018 in the town hall of Reykjavík. Among other things, Brandur spoke to the President of Iceland, Mr. Guðni Th. Jóhannesson, about the possibilities of Blockchain. Brandur Bjarnason KARLSSON is very active and has participated in workshops of the Prime Ministry and discussed the future strategic objectives of Iceland. He founded Frumbjorg, a social innovation center in Reykjavik. He won the Nordic Startup Award last year. Brandur Bjarnason KARLSSON also advises the Ministry of Social Affairs on innovation.